Four historical vignettes are provided from the period 1875 to 1880 from the Proceedings of the Telegraph Electrical Society of Victoria ? the lineal antecedent of today?s TelSoc (Australian Telecommunications Society). The extracts cover Alexander Graham Bell?s invention of the telephone, Telegraphy at the downfall of the Kelly Gang, the speed of the Morse system, and the curious phenomenon of ?Fighting by Telegraph?. Peter Gerrand?s article in the June issue of the Australian Journal of Telecommunications and the Digital Economy (Gerrand 2014) traced the opening of the first telegraph office in the Southern Hemisphere back to Melbourne, Australia on 3rd March 1854. Twenty years later in 1874 (and two years before Alexander Graham Bell patented the telephone), several like-minded telegraph workers and country postmasters formed the Telegraph Electrical Society of Victoria. The purpose was for mutual discussion of day to day telegraph problems and the advancement of their technical and practical knowledge (Credlin 1938). The Proceedings of the Society were published on a quarterly basis and lecture pamphlets were reproduced in newspapers of the day such as The Argus. This paper features four extracts from those Proceedings, which resonate into the modern era. 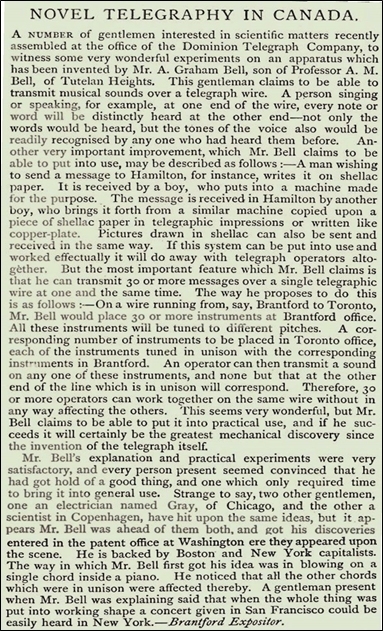 The first extract, entitled ?Novel Telegraphy in Canada?, was published in 1876. It perspicaciously described Dr Bell?s invention of the telephone as ?very satisfactory? and ? [it] will certainly be the greatest mechanical discovery since the telegraph?. The second extract, entitled ?Extermination of the Kelly Gang?, was published in 1880. It described two Posts and Telegraph personnel who attended the siege at Glenrowan. One bravely climbed a pole while bullets were flying to establish a telegraph connection to Melbourne, and the other relayed continuous updates on the situation. 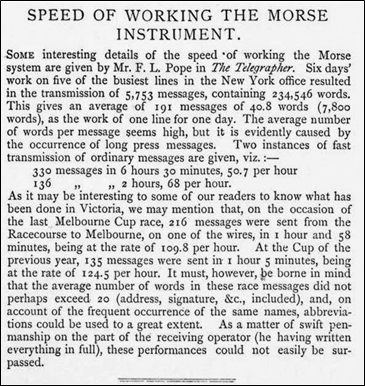 The third extract, entitled ?Speed of Working the Morse Instrument?, was published in 1875. It discussed the top speed of Morse messages on the busiest telegraph lines in New York, USA. Not to be outdone, the Victorian operators covering the Melbourne Cup demonstrated they could send messages at double that speed. 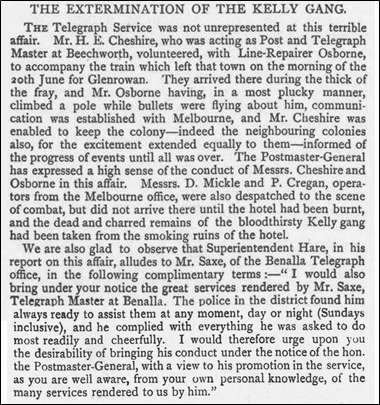 The fourth and final extract, entitled ?Fighting by Telegraph?, was published in 1880. 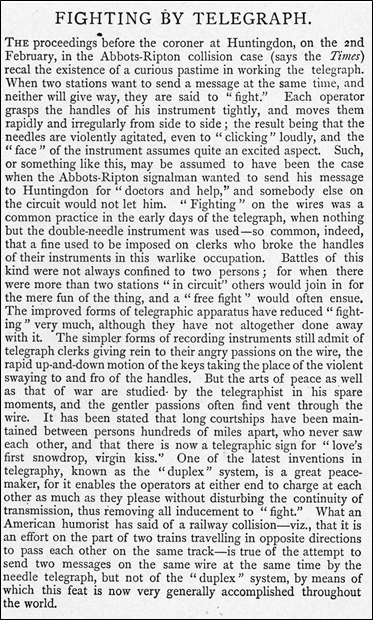 It is a curious article describing the fighting by operators over telegraph lines, before reliable duplex systems were introduced. These extracts were all published later in a Society paper entitled ?Centenary of Telecommunication Societies in Australia?, written by J.E. Sander for the Telecommunication Journal of Australia, the predecessor of this Journal, in 1974 (Sander 1974). Credlin, E.J. 1938. ?The Early History of the Postal Electrical Society of Victoria? ; Telecommunications Journal of Australia, June 1938, Vol. 2, No.1, pp. 2 ?4. Sander, J.E. 1974. ?Centenary of Telecommunication Societies in Australia?, Telecommunications Journal of Australia, Vol. 24. No. 2. 1974, pp. 177?179.